Medical Service Centre Central Committee [MSC], a national-level socio-medical voluntary organisation committed since more than past three decades and a half to stand by the hapless in times of disaster, distress and deprivation responded to the devastation at UK by sending first medical response teams to work for the local inhabitants centring the affected dt. of Rudraprayag [RPG]. The 4-member Survey Team supported by the Socialist Unity Centre of India (Communist) [SUCI(C)] surveyed the rural mountainous regions starting from 23 June 2013, walking up to Chandrapuri. A 6-member Pilot Medical Team from various states to deal with problems of medicine, trauma & psychological trauma, led by Dr. Ansuman Mitra, Joint Secretary, MSC & In-charge, Disaster Response Cell joined from 28 June to first set up the Rudraprayag Base Camp which started operation from 29 June in front of the Vikas Bhawan, Main Market Complex, RPG town, the dt. headquarter, with logistic support provided by the SUCI(C). Mobile medical teams have been moving out to the affected villages to care for the inhabitants of this part of the Garhwals. Prof. Vinayak Nerliker, Former HOD, Orthopaedics, Nashik Medical College & Vice President MSC joined to lead the exploration on 2 July 2013 for an Advance Base Camp which was set up on 6 July at Banswara-Bhiri which includes a diagnostic laboratory facility. 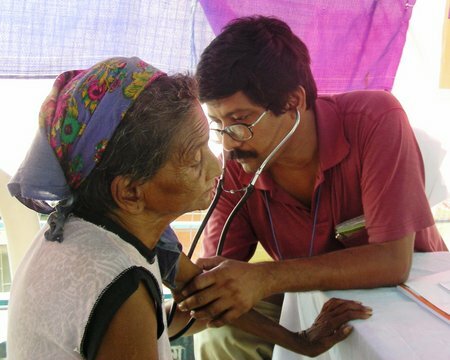 Till date more than 50 volunteers, also comprising of specialists in paediatrics, paediatric surgery, critical care, and nurses, lab technicians & health workers mobilised by our state committees across the country including Kerala, TN, Maharashtra, MP, Gujarat, Punjab, Chandigarh, Delhi, UK, UP, WB have been consistently rendering basic medical clinical, diagnostic and therapeutic services. We have conducted 37 camps1 till date, where above 5000 patients from over 250 villages & towns2 were examined; medicines worth about Rs. 7.5 lakhs have been dispensed; logistic expenses till date have been around Rs. 6 lakhs, all through contributions collected by dedicated volunteers from concerned citizens across the country. (For details and pictures please follow www.medicalservicecentre.org & www.facebook.com/uttarakhandreliefactivity).